The Guardit sealers are a commercial paving sealer. Horizon International, stock and recommend pavers sealers suitable for each of their paving products. It is important to realise sealers are not created equal. Not all sealers are suitable for all paving products. Natural Stone has different technical properties to a concrete paver and as such require a different paving sealer, a small test area should always be trialled. The Guardit range has been used extensively on Horizon Veneto paving and natural Stone paving. GuardIt Solutions All Stone Sealers are designed for natural stones, Pre-Cast pavers and brickwork. 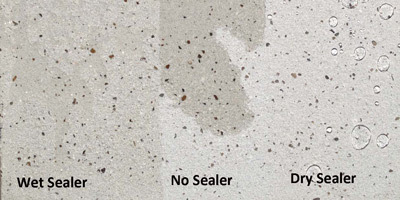 These unique water- based sealers do not affect the natural appearance of the substrate or the slip code rating, whilst giving superior protection against all stains. GuardItAll Stone Sealers are the most effective water-based products available because of the unique benefits offered with regard to penetration, durability and they do not change the substrates appearance. It’s invisible upon application and maintains the natural look, feel and texture of the stone. It provides years of supreme protection! The GuardIt Solutions range features a Drylook sealer and a Wetlook sealer. Both products provide protection from staining and assist in long term maintenance/cleaning of Horizon products. The choice between wet or dry is mainly aesthetic. The Guardit products are water-based removing the liability of solvent in handling shipping and application. In the case of the Veneto pavers Horizon can even apply the sealer for you as part of the manufacturing process.